We’re barely into spring, and yet temperatures in Southern California are already spiking. If your old air conditioner isn’t ready to face the challenges of another scorching summer, now is the time to get it replaced. You still have a few weeks to plan the operation properly, and with the right service in your corner, you can have a new system up and running well before the summer begins in earnest. That means proper planning and as you consider your options, there are several factors you need to keep in mind. Before any other aspect of your new air conditioner is determined, you need to determine the appropriate power levels for your home. You likely know that an underpowered air conditioner will cause no end of problems: running constantly, wasting energy and never getting the space as cool as you need it to. However, overpowered air conditioners can cause similar problems: something that often seems counterintuitive at first glance. “Don’t you WANT a more powerful system? Won’t it cool the house faster?” It will, but unfortunately, that’s not a good thing. 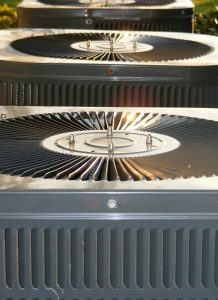 Air conditioners use far more energy when they start up and shut down than they do simply running. If the system is too powerful, it will cool the home too quickly and shut down, only to start up again a few minutes later. The process is known as short-cycling and it can greatly increase both the cost of running the system and the wear and tear on individual components. Your technician can inspect your house for factors like square footage and insulation, then calculate a power load for your new air conditioner that fits it perfectly. “Don’t you WANT a more powerful system? Won’t it cool the house faster?” It will, but unfortunately, that’s not a good thing. Air conditioners use far more energy when they start up and shut down than they do simply running. If the system is too powerful, it will cool the home too quickly and shut down, only to start up again a few minutes later. The process is known as short-cycling and it can greatly increase both the cost of running the system and the wear and tear on individual components. Your technician can inspect your house for factors like square footage and insulation, then calculate a power load for your new air conditioner that fits it perfectly. Once you know the required power load, you need to consider the efficiency of the system. (Efficiency needs to come second, not first, since a more efficient unit won’t help you if it’s underpowered or overpowered.) Air conditioners measure efficiency with a SEER rating, which stands for Seasonal Energy Efficiency Ratio. The higher the rating, the better use the system makes of the energy consumed. Look for systems with the highest SEER rating in your price range, not only to keep your monthly bills as low as possible, but to help ensure that your system lasts longer without suffering a breakdown. In addition to the system itself, you may want to look into upgrades: bells and whistles that come on top of the system itself, and which can help improve efficiency or provided added benefits. They can include such things as a new “smart” thermostat, which can analyze your cooling patterns and make little adjustments to correct it; or zone control systems which divide your ducts into sections and let you heat or cool separate parts of your home independently. Your technician will have a list of options for you and can make recommendations based on your budget and on the individual needs of your house. If you’re looking for a new air conditioner for your Whittier, CA home this spring, trust the professionals at Greenleaf Heating & Cooling to get the job done!